In the landmark U.S. Supreme Court decision McCulloch v. Maryland, Chief Justice John Marshall famously wrote, “… we must never forget that it is a Constitution we are expounding.” 17 U.S. (4 Wheat.) 316, 407 (1819). Laden with meaning, and the subject now of nearly two centuries of debate, scholarship, and critical review, this statement at the very least reminds us of the importance federal and state constitutions play in our uniquely American form of government. Approved by the territorial voters in the July election of 1876, the Colorado Constitution has an interesting past. The circumstances of its adoption, its subsequent (and frequent) amendment, and its ongoing application to everyday affairs are of vital importance to the citizens of our state. This installment of West to the 32nd Meridian offers a glimpse into the past and present of this most important of Colorado legal texts. Since the Ordinance of 1787, federal territories admitted to the Union as states are done so on an equal footing with the original 13 colonies. The mechanism for this process is called an Enabling Act. The Colorado Constitution was authorized by the U.S. Congress when it passed an Enabling Act on March 3, 1875 (18 Stat. 474). That Act specified the requirements necessary for Colorado to become a state. Once met, the Act authorized the President to proclaim Colorado a state without any further action by Congress. Pursuant to the Enabling Act, 39 men were elected from among the territorial counties to serve as members of a constitutional convention. The main purpose of the convention was to draft a state constitution. The convention convened on Dec. 20, 1875 and worked for 87 days, after which time the proposed constitution was signed and delivered to the voters for approval. The members began signing the document on March 14, 1876, and were allowed by agreement to do so until election day. The election was held on July 1, 1876. Territorial voters approved statehood by a vote of 15,443 to 4,039. Later in July, an engrossed copy of the written constitution and its accompanying ordinances were delivered to Washington, D.C. Fulfilling his responsibility under the Enabling Act, President Ulysses S. Grant proclaimed Colorado the 38th state on Aug. 1, 1876. R.W. Woodbury, editor and proprietor of the Denver Times, dubbed Colorado the Centennial State in recognition of its creation 100 years after our nation’s Declaration of Independence. A constitution is “the paramount law of a state, designed to separate the powers of government, defining their extent and limiting their exercise by the several departments, as well as to secure and protect private rights, and no other instrument is of equal significance.” Ex Parte Corliss, 114 N.W.962 (N.D. 1907). As the jurisdiction’s original statute, it is defined as “organic” law. Put another way, it is the source document for a state’s law. Once established, state law extinguishes federal territorial law unless it is explicitly preserved in the Enabling Act and/or statutorily re-enacted by the new state’s legislature. 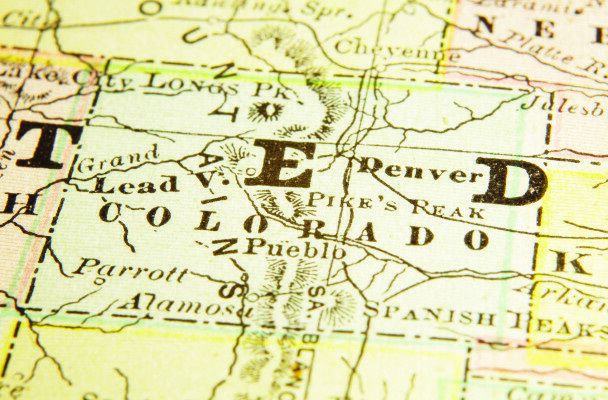 In Colorado, much of the existing territorial law was formally adopted into our new state code. Done during the First Session of the Colorado State General Assembly, which met between November 1876 and March 1877, the proceedings were published as a part of the 1877 General Laws of Colorado, but not separately. The unpublished handwritten House and Senate journals memorializing the First General Assembly are held at the Colorado State Archives. The Colorado Constitution has undergone many changes since its adoption in 1876. In the original document, Article XIX specified the only two ways of amending the Constitution. Specifically, it provided for a constitutional convention (Art. XIX, sec.1) or amendment by a 2/3 vote of the General Assembly with approval by a majority of registered voters at the next general election (Art. XIX, sec.2). To date, no convention has been called; however, in 1976, a citizens’ group recommended a Constitutional Review Commission to study and develop a plan for the best way to update our current constitution for the next century. A decade later, a model constitutional convention was held in 1987 to examine our constitution in celebration of the U.S. Constitution’s bicentennial. Nevertheless, the convention remains a legal, if unused, method for amending the Colorado Constitution. Approved by the voters on Sept. 2, 1910, H.B. No. 6 (An Act to Submit to the Qualified Voters of the State of Colorado an Amendment to Section 1 of Article 5 of the Constitution of the State of Colorado, Providing for the Initiative and Referendum) created two additional amendment methods: the initiative and the referendum. Most important is the initiative, now found in section 1(2) of Article V. The initiative reserves to the people the power to amend the Constitution or enact a statute by petition followed by popular vote. Following the procedures set forth by statute at C.R.S. 1-40-101 et seq., citizens are empowered to initiate legislation (statutes or constitutional amendments) independently of the general assembly. Differing by whether the people urge the change through a specified number of signatures verified by the Secretary of State (initiative) or whether the legislature suggests the change for popular approval (referendum), both measures appear on the ballot in the next general election for voter approval. Collins, Richard B., “The Colorado Constitution in the New Century.” University of Colorado Law Review.78, no. 4 (2007): 1265-1335. Collins, Richard B. and Dale Oesterle, “Structuring the Ballot Initiative: Procedures that Do and Don’t Work.” University of Colorado Law Review 66, no. 1 (1995): 47-127. Hersey, Henry J., “The Colorado Constitution.” Colorado Magazine 3, no. 3 (1926): 65-76. Oesterle, Dale A. and Richard B. Collins, The Colorado State Constitution: A Reference Guide (Westport: Greenwood Press), 2002. O’Connor, Timothy, comp., The Proceedings of the Constitutional Convention held in Denver, December 20, 1875 to Frame a Constitution for the State of Colorado (Denver: The Smith-Brooks Press, State Printers, 1907). By Dan Cordova and Chris Hudson. Dan Cordova is the Colorado Supreme Court Librarian. Chris Hudson is the Deputy Colorado Supreme Court Librarian for Education and Outreach. They can be reached at 720-625-5100 or library@judicial.state.co.us.